Submitted by Anne Schoeffler on 26 June 2016. This project is named for pollinators, but we haven't talked about bees at all. How could that happen? Bees are the least common pollinators in Greenland, but they are also the most effective ones because they carry more pollen than flies or mosquitoes; they can carry thousands of grains of pollen, while the others can carry only a few. There are more than 25,000 species of bees in the world, but only two in Greenland: Bombus polaris and Bombus hyperboreus. (There are also some managed hives of honeybees further south.) These Bombus bumblebees are hairier than other bees. Bombus polaris is similar to other bees in that each swarm has a female queen, males, and workers. The workers are similar in size to worker bees of other species, the males are smaller, and the queen is very large. 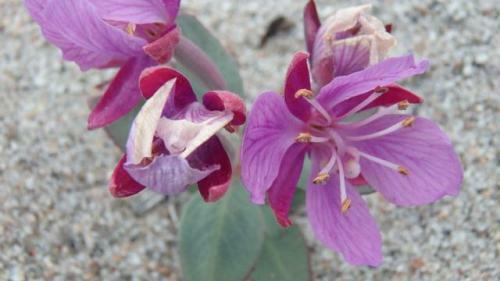 These bees are commonly found on niviarsiaq and bog bean flowers because they bloom at the same time as the bees emerge. These bees can range at least 5km (more than 3 miles) foraging for food! 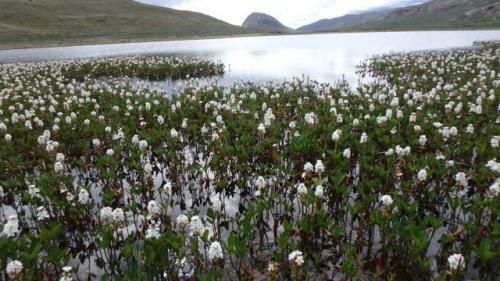 A small lake adorned with bog beans and looking toward Sugarloaf. 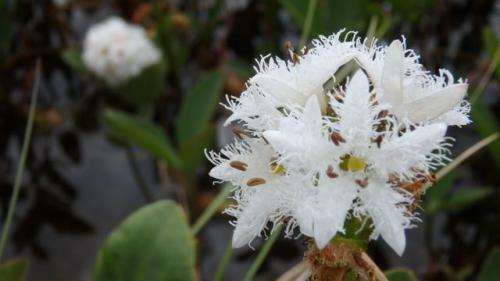 Bog bean flower blooming in a small lake. Bombus hyperboreus is not like other bees, however. It is a nest parasite and takes advantage of Bombus polaris. All hyperboreus bees are queens, and they are also very large just like polaris. When a hyperboreus queen finds a polaris hive, she kills the queen and drags her outside. Then she lays her eggs in the hive, causing the polaris workers to care for the new hyperboreus bees. Harsh reality! There are also flies here that look much like bees and are called botflies. When any species develops to resemble another species, usually for its own protection, this is called biomimicry. Botflies are black and yellow, so they can be mistaken for bees. 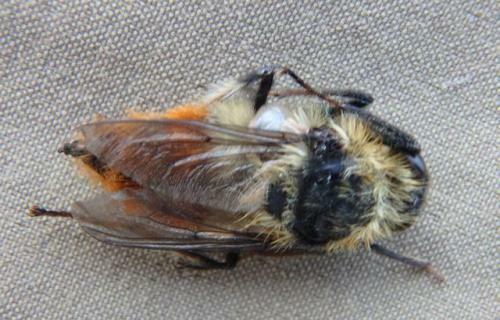 Botflies are also parasites, laying their eggs in the respiratory systems (noses and throats) of caribou. This can inconvenience the caribou, or in extreme cases, it can cause the caribou to suffocate. A botfly looks very similar to a bumblebee. Today we netted both Bombus polaris and botflies on the shores of a beautiful lake! Ackowledgement: Christine Urbanowicz is a great bee resource! 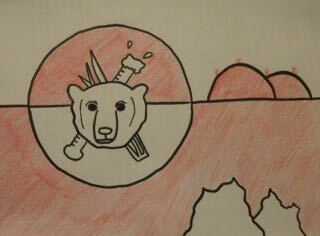 Greenland flag with a polar bear by Carter.